Game developer and writer Konstantinos Dimopoulos has crowdfunded an atlas exploring the design of cities in video games. 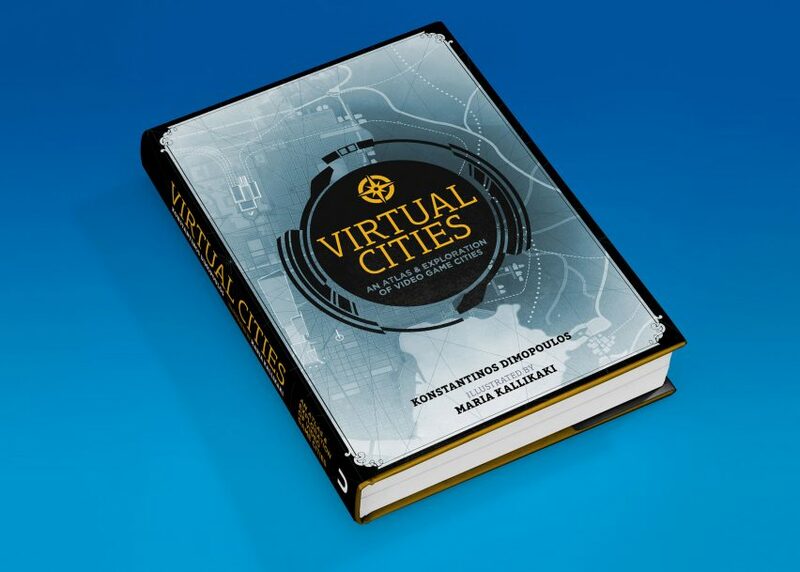 Virtual Cities: An Atlas & Exploration of Video Game Cities will be published by Unbound and feature hand-drawn illustrations by visual artist Maria Kallikaki. From the irradiated post-apocalypse landscape of Fallout's New Vegas to the supernatural horror of Silent Hill, the book will feature 40 cities from 40 years of digital gaming history. The atlas will include full-colour maps and illustrations alongside commentary and analysis of the virtual urban environments. Dimopoulos, who has a PhD in urban planning and geography from the NTUA School of Architecture, started working for game developers after the 2010 financial crisis in his native Greece made an academic career untenable. Now he works full time designing cities for games, mapping out their geographies and creating rules and mechanisms for these virtual urban systems, as well as writing about them. "I would describe game urbanism as a relatively new and truly intriguing area that allows for exciting research possibilities," Dimopoulos told Dezeen. Historical cities often prove fertile ground for inspiration, as with other forms of fiction. As Dimopoulos points out, the late author Terry Pratchett cherrypicked from real cities such as Tallinn, Prague and London to create Ankh-Morpork. "Convincingly abstracting an actual urban setting into something both economical and believable can be very taxing indeed," explained Dimopoulos. "Re-creating a New York that feels right can be very difficult." Creating a game city from scratch or within a fantasy setting might mean spending more time hashing out the in-world rules, but it gives developers more creative license. "Tackling a truly exotic virtual city set in, say, outer space and inhabited by a variety of species, or attempting to imagine a fantasy town in an intricately crafted Tolkien-esque world can be immensely satisfying," he explained. "The freedom and exotic problems such places provide can truly be entertaining and get a designer to apply scientific knowledge and planning best practices in really unexpected ways." Believability is key, even when it comes to a city set in a completely made-up world. If a city doesn't make sense as the player explores it, then you risk ruining the immersive experience. "We are, after all, a pretty experienced urban dwelling species that can easily say when something feels off," explained Dimopoulos. A great virtual city, on the other hand, is one that actively adds to the gaming experience in a genre-appropriate way he believes. "A city can helps amplify a game's atmosphere with its dark narrow streets and tall eerie buildings in a horror offering, provide with unique routes and good hiding spots in a stealth game, or even be used as a huge canvas for environmental storytelling," he continued. Dimopoulos cites Gerudo Town from Zelda: Breath of the Wild as an example of how "considering even the most fundamental and often boring aspects of urbanism can lead to simultaneously sensible and utterly whimsical creations." Thanks to its desert setting, Gerudo Town would logically need to provide residents with access to drinking water and shelter from the sun. "The dev team went on and satisfied this almost mundane set of needs by having fresh water flowing over the roofs of the settlement in a network of connected, tiled pools and open canals that made sure all the digital denizens of the place lived in cooled buildings, and could easily access water," Dimopoulos said. "The apparently magical geyser providing the initial water supply just rounded things off." City 17 remains, even 14 years after its unveiling, one of the most iconic, convincing, and economically designed game cities ever crafted. The massive citadel tower at its centre serves as a defining landmark and orientating gameplay goal. The place's history is evident in the evolution of its architecture, and its planning choices support the nature of the gameplay, allowing the city to imply and not show its whole self. This great harbour of the afterlife with its art deco skyscrapers, art nouveau clubs, and glorious Mesoamerican influences is a memorable and vibrant metropolis of the dead. It also happens to be one of the select few virtual cities I keep revisiting regularly, if only to admire the imaginative yet convincing world building, the palpable sense of tension, the noir sensibilities of the place, and of course the sheer excellence of the game and writing. Obviously inspired by New Orleans and yet retaining the sort of uniqueness only imaginary places can afford, New Bordeaux is a rare game town that feels almost real. Its varied architectural styles, vibrant public spaces, carefully considered civic life, impressive size, and the care for the natural geography of the places really make this a convincing and interesting city to explore. Fallen London is like actual London, only after losing the war with the bats. It is thus slightly closer to Hell, made up almost entirely of excellent prose, and filled with playful takes on Victorian urbanism and city life. It's an unique, fascinating, and completely outrageous place that keeps on evolving and changing. The work of M C Escher was an obvious inspiration for the aptly named Antescher, which also most probably was the very first 3D game city that could be explored from the comfort of an 80s home. This was a place of paths, landmarks and fossilised mysteries, a stylised ancient town overrun by murderous ants, and a technologically groundbreaking representation of urban ruins.